MOUNT GILEAD — The Morrow County Sheriff’s Office is looking for a man in the area. Michael Lee Ball is currently wanted for parole violation/absconding from parole supervision. He is believed to be in Galion or the northern Morrow County area. “Do not attempt to stop, detain or arrest this individual on your own. Please contact our dispatch center (419-946-4444) if you know his whereabouts,” Sheriff John Hinton said. 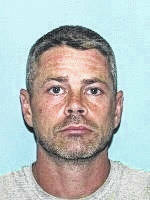 Ball is a white male, age 39, 5-foot-9, 180 pounds with brown hair and blue eyes.